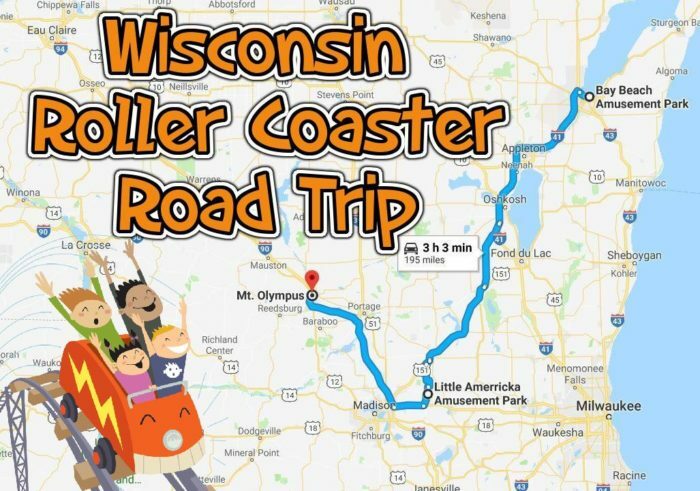 For all the fun waterparks and adventures you can get up to in Wisconsin, it turns out there are just 10 roller coasters here in our great state and lucky for us, they’re all within a few hours of each other. Our adventures are less of the “scream your head off, lose your mind” sort and more of the vintage, unique, and very cool type. 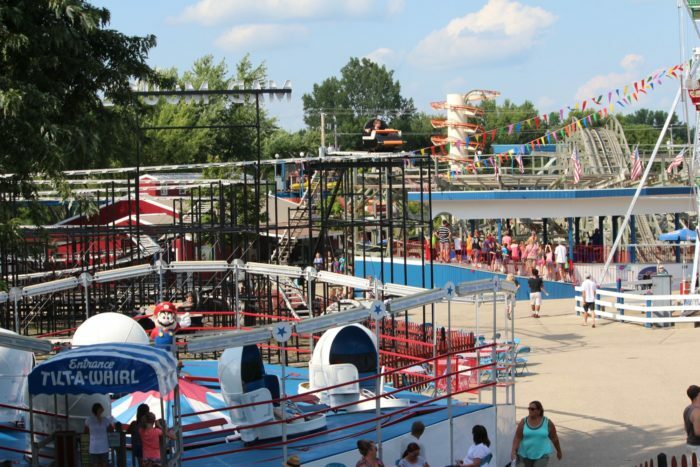 From the 127 year history of Bay Beach Amusement Park to the nostalgic collection of Little Americka and the thrill-a-minute, action-packed fun at Mt. 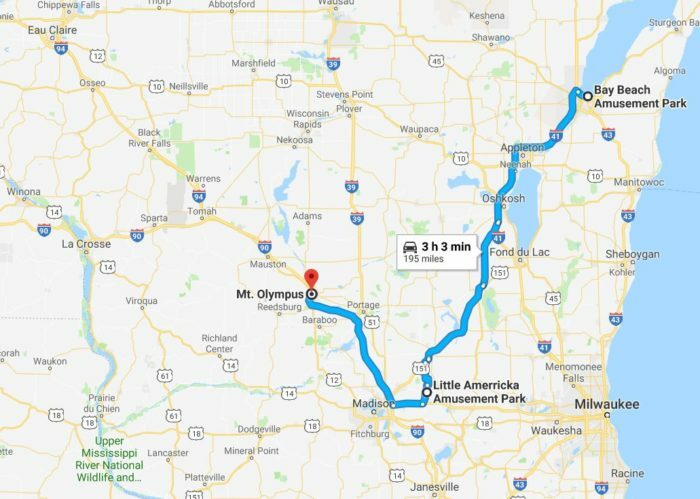 Olympus, you can put together a pretty amazing weekend visiting all of Wisconsin’s best roller coasters. Grab the interactive map for the road trip here. 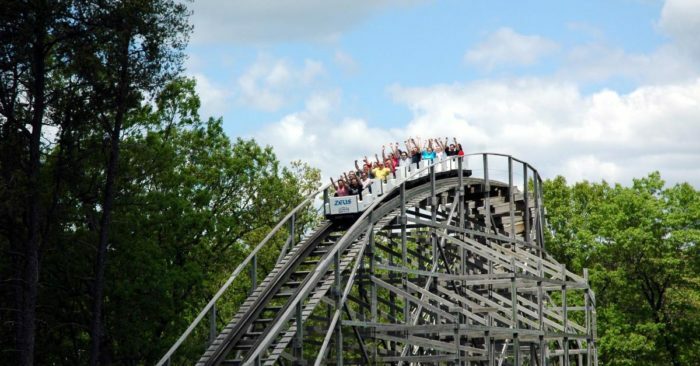 Without any huge, major amusement parks, the idea of packing a weekend full of visiting Wisconsin's only roller coasters is actually super attainable. What better way to spend a weekend than packing it full of the fun, exhilaration, and screams of 10 roller coaster rides? You can visit these three in pretty much any order you'd like and not add much time to your trip. Though it looks odd to have the trip to Little Americka in the middle, that's actually the shortest route according to Google. Regardless of how you plan your days, you can easily fit all the rides into a short two or three-day trip. 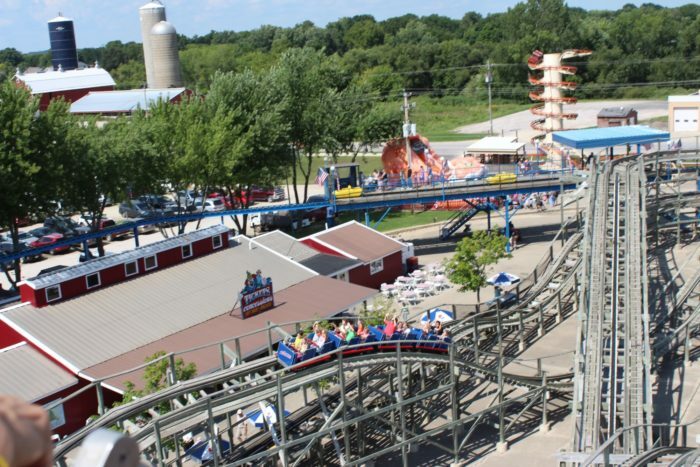 There are five different coasters to try at this Wisconsin Dells mecca for thrills. We're focusing on the roller coasters, but there are all kinds of rides here to get your adrenaline up. Bring a swimsuit and get some scares doing a few of their death-defying waterslides, as well. Mt. 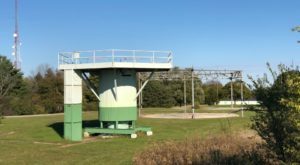 Olympus is located at 655 N Frontage Rd., Wisconsin Dells, WI 53965. This big coaster has two huge drops that will leave your stomach near your throat. Prepare to get thrown around in your seat a bit. The track intermingles with others along the way and one of the drops features a turn that takes you right by a walkway that will make you feel like you're about to take out some other park-goers. Another wood coaster, this is unlike any other wood coaster you've ever been on. 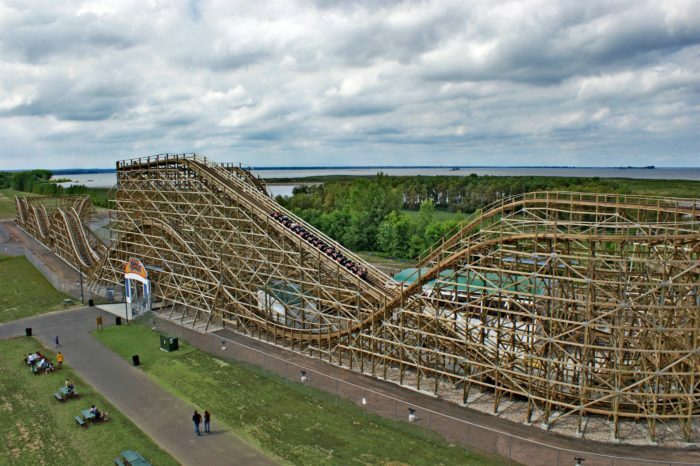 This is the world’s first upside-down wooden roller coaster, with the world’s longest underground tunnel. If you can't take some major scares, don't even bother getting on this one. You'll take a major drop into a tunnel that does underneath the parking lot. It's pitch black for a solid five seconds before emerging directly into a corkscrew that will leave you disoriented and wondering about your life choices. It's scary — but fabulous. This is the second-biggest coaster here though folks say they love Cyclops more. You'll get a pretty standard wooden ride on this one, with a big 85-foot drop and a lot of shaking around. This one is obviously for the little folks, but it's more than a simple ride, with good tilting and turning that makes for a fun ride. This nostalgic and old-school amusement park has four different coasters for you to explore, but you should definitely wander the whole place and check it out. This is what love and nostalgia for old-school thrill rides look like. 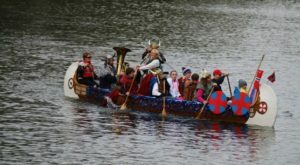 These folks have stuff you won't find anywhere else. Definitely on the tamer side, these are historic pieces that have been lovingly preserved here. 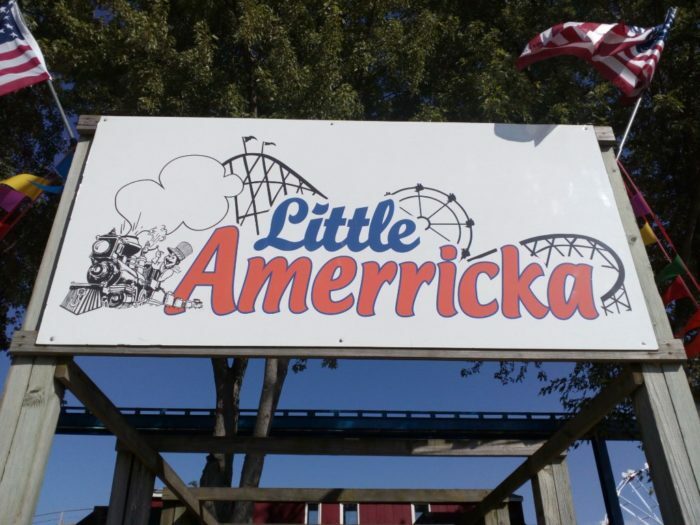 Little Americka is located at 700 E Main St., Marshall, WI 53559. When older amusement parks close, often their old wooden roller coasters are just dismantled. This coaster dates back to the 1950s and was salvaged from the scrap heap to be brought to Little Americka and rebuilt and restored. Using the original blueprints, this coaster was lovingly brought back to life and given a second chance to thrill riders. It's a nostalgic ride that isn't too fancy but provides plenty of fun and is an awesome homage to the early life of coasters. This unique coaster features free-moving individuals carts — there is no long train of cars. Instead of a big drop that will then carry the ride through the rest of the way, this is one little cart that jerks you around tight turns while you're a few stories up in the air. It'll trigger all your fears as you're on a thin track and there's not much between your and the ground. You'll feel like you're about to go right off the track before being pulled in another direction. It's a different kind of thrill and a lot of fun in it's own right. There are only a handful of this unusual style of coaster left in the world and this one is the very first of this kind ever made. You're inside a fairly tight cage and you climb inside the tube vertically before being spit out at the top to twirl your way back down to the bottom. When you are done with the dizzying descent, there are a few dips and turns to send your tummy tumbling before the ride is over. It's weird and kind of wonderful. This fun kids coaster was in someone's private back yard, which sounds rather awesome. 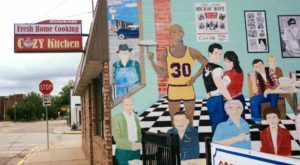 His town said it had to go and Little Americka bought it sight unseen with just a picture or two to show that it was a worthy purchase. 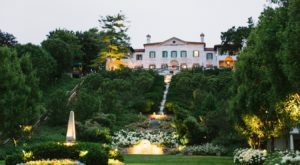 Dating back to the early 1950s, it's got plenty of awesome original details to check out. 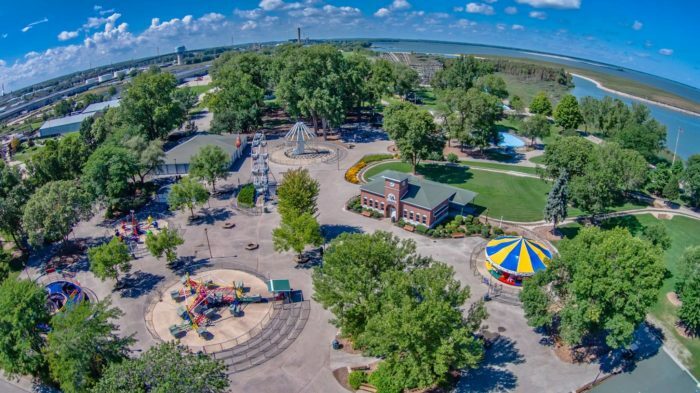 If you've never taken the time to head to Bay Beach near Green Bay, add a day to this road trip and just plan on spending a truly fabulous day at this amusement park that's a throwback to another time. 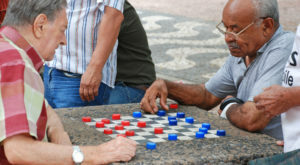 Opened in 1892, this place has been providing fun to the locals for 127 years! It sits at the spot where the Fox River runs into Green Bay, so it's a beautiful location. All tickets are 25 cents. 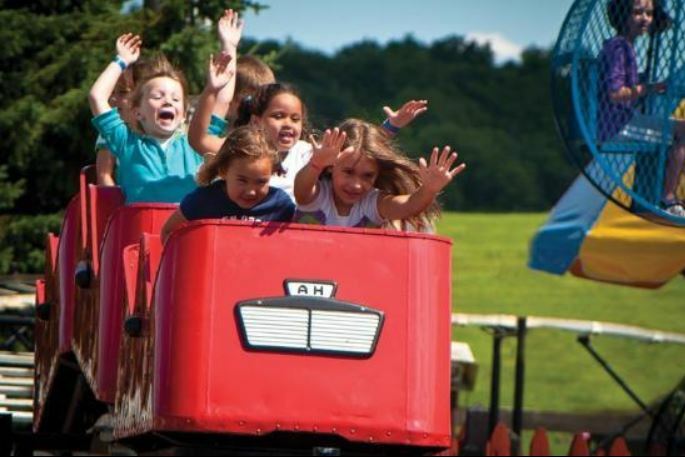 All rides take between one and four tickets. Parking is free and there is no general admission charge. 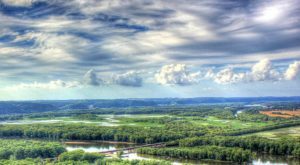 This is a truly spectacular gem here in Wisconsin. If you have time to check out the animal sanctuary next door — which is also free — you definitely should. 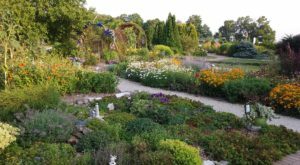 Bay Beach is located at 1313 Bay Beach Rd., Green Bay, WI 54302. One of the oldest existing wooden roller coasters in the world, the origins of the Zippin Pippin are a little murky. 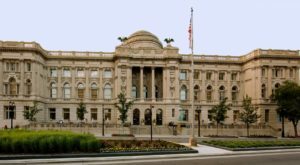 It dates back to the 1910s and was in Memphis for most of its life as part of their Libertyland. 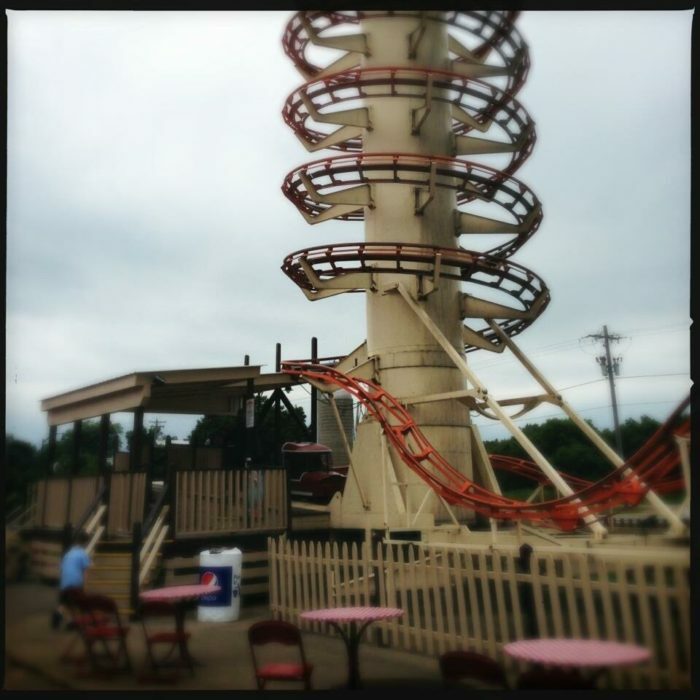 The coaster is said to have been a favorite of Memphis local Elvis Presley, who would rent out the park and ride it for hours. 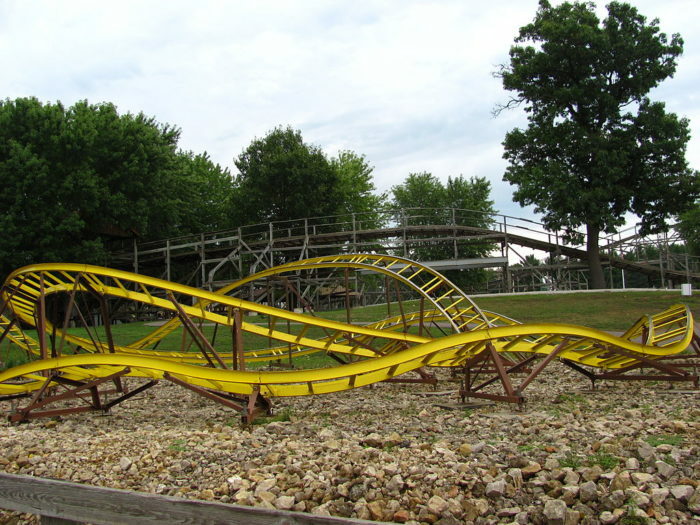 The coaster was in rough shape in the early 2000s and was dismantled. Much of it wasn't salvageable, but eventually, the coaster was brought to Bay Beach and reconstructed. 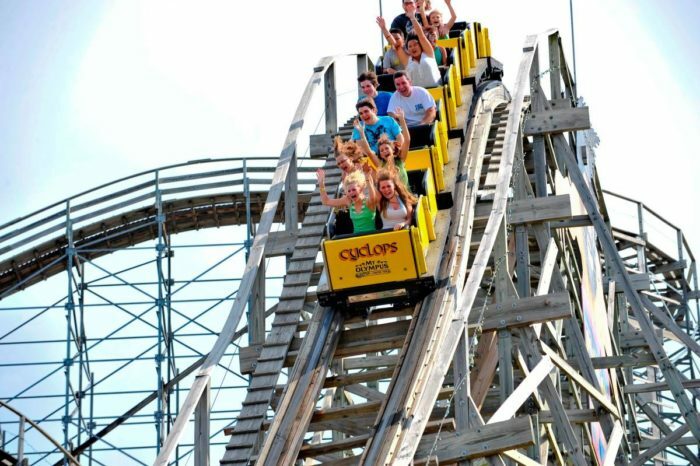 It reopened in May 2011 and the large coaster has greatly increased the number of folks who visit Bay Beach. From the top, you get a spectacular view of the whole park as well as the water, so make sure you open your eyes before the big drop! 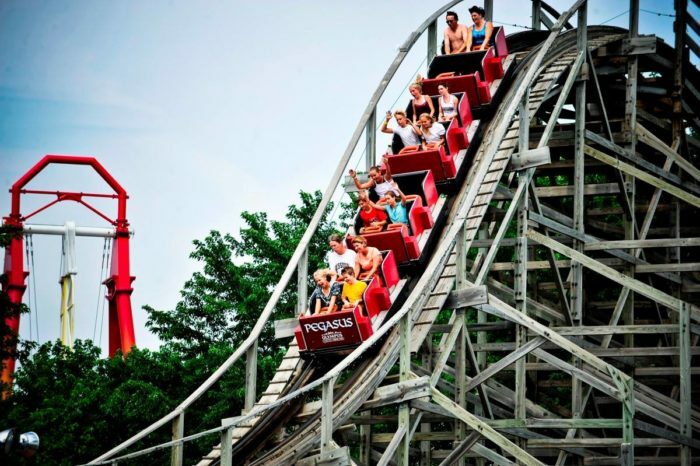 Which Wisconsin roller coaster is your favorite? Have you ever attempted to ride them all? Let us know in the comments! 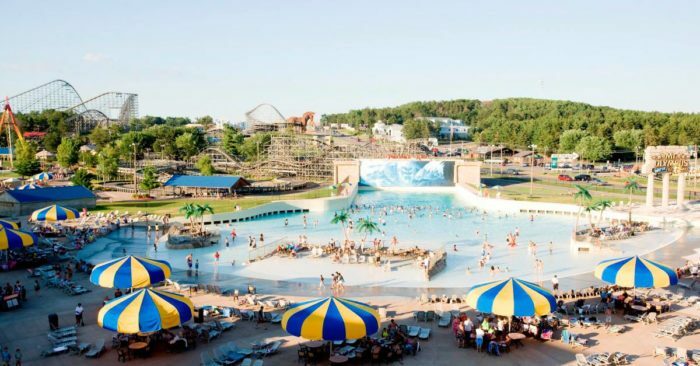 If you’re a thrill-seeker, you have to check out these amazing, hair-raising waterparks in Wisconsin!